Microsoft is facing an uphill climb against Apple and Google. Apple has a runaway success with its iOS while Android is gaining momentum with its Android OS. Microsoft is late to the game but it has recently made huge progress with its Windows Phone OS. We expect for updates to keep coming and right now, the latest batch of updates is included in the Windos Phone Mango version of the OS. Microsoft recently announced the new key features of the latest ‘Mango’ release of the Windows Phone. According to Microsoft, this is the version of the software that will be used on Nokia Windows Phone devices. Here are the main features of the Mango release. Better social integration – Facebook was already deeply integrated into Windows Phone. Mango sees the arrival of Twitter and Linked-In to the mix, with the latest updates from your contacts appearing in contacts. Facebook location check-ins are now also supported and there’s new facial-recognition software to make tagging photos easier before you upload them. Linked inbox – This frequently-requested view allows users to combine the contents of several inboxes into one. Mail is organised into conversations, so the latest updates are always at the top. Threads – Carry on your conversation with SMS, Facebook chat and Windows Live Messenger on the same screen – so you can concentrate on the information, not which app you’re using. Hands-free messaging – Text-to-voice and voice-to-text engines allow for easier texting and chatting while you’re on the move. 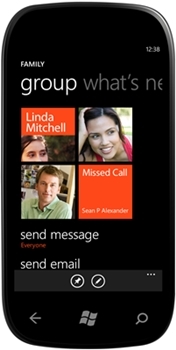 Groups – put a bunch of contacts into their dedicated Live Tile so you can quickly see their latest updates and send a text, email or IM to the whole group right from the home screen. Improved Live Tiles – these can now hold more information and be more dynamic. App Connect – apps can now be included in searches (e.g. when you search for ‘movies’, the results include apps that help you find films showing in local cinemas). Multitasking – switch quickly between apps and allow apps to run in the background. Internet Explorer 9 – the built-in browser provides support for HTML5 and full hardware acceleration. Local Scout – This app provides hyper-local search results for information on shopping, restaurants and activities. Better Bing – Mango provides new ways to search including Bing Vision, Bing Audio and voice. Here’ a video introduction from Microsoft on the key features of the Mango release. And here’s the promo video for Windows Phone Mango. Looks like Mango is a really yummy update. But will this be enough to beat Android and iPhone? Only time will tell.